Cheesy Cauliflower Gratin with Saffron Cream Sauce for Thanksgiving! This week’s Fall Fest is a special event. We are celebrating Thanksgiving and inviting you all to join us and Pull Up a Chair! We are having a virtual potluck dinner. We decided what we wanted to bring, made our dish and are sharing them with you so you can be part of the fun too! Follow along with our tweets at #pullupachair and make sure you check out all the amazing dishes below or pop over to FN Fall Fest and visit our Pinterest page. I wanted to create something for you that can be a fun departure for those guests who are a little more adventuresome, but still close enough to a common Thanksgiving side dish so that the diehard traditionalists at your table won’t be disappointed. I think you’ll agree with me when I say that this will most definitely be making repeat appearances at our holiday feasts! Creamed onions and other au gratin dishes often show up during the holidays because they can be made ahead, usually taste better the second day, and transport beautifully, and this recipe is no exception. You can make and assemble it a day ahead, cover it, and store in the refrigerator. The next day just pull it out thirty minutes before you want to bake it – seriously reducing your headaches on Thanksgiving Day! If your family doesn’t like too many variations from what they have eaten all their lives, keep the turkey, stuffing, and potatoes very traditional. The vegetables and side dishes are where your creativity can shine. Make sure you have something simple like steamed green beans for the picky eaters and then have fun with the rest. Feel free to leave out the hot peppers if your family doesn’t like spicy food, or add more if they usually have a bottle of hot sauce right next to their plates. Spanish Marcona Almonds lend a lovely crunch to this casserole. I love cauliflower but The Artist doesn’t. He is a broccoli guy, so when I make this dish for our family I use a combination of the two vegetables. It makes a lovely, colorful side dish and because of the cheesy, creamy sauce, even children will eat their vegetables. 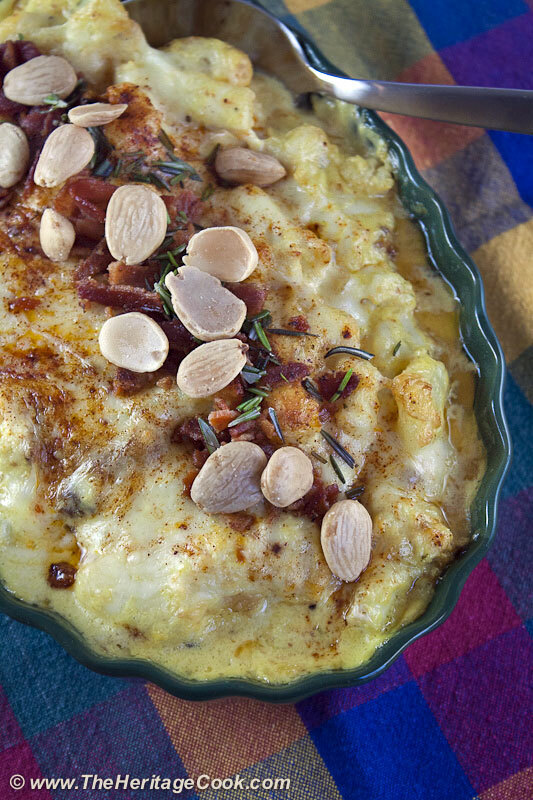 Of course bacon makes everything better and Marcona almonds are an extra special treat, so this is truly a dish to be thankful for! I hope you enjoy this Spanish-inspired version of the classic cauliflower with cheese sauce. It would be equally wonderful alongside roasted prime rib, grilled salmon, or duck breasts. It will make any meal seem like a gourmet treat and because it can be assemble the day before, you can focus on the other elements of you meal without worrying about the vegetable course. Have fun at our virtual Thanksgiving potluck and Pull Up a Chair with all of us. I know you will get some incredible ideas for your own Thanksgiving dinner! When you are planning your Thanksgiving menu, look for recipes like this one that you can make wholly or partially in advance. Turn on fun music and try to enjoy your day in the kitchen without stressing too much. Everyone will love your efforts and soon you can sit back and relax with your family and friends. Where you would usually need a roux to thicken the cream sauce, by pureeing the almonds, you get a natural thickener. A touch of xanthan gum helps make the final sauce thick and creamy. It occurred to me as I was prepping this dish that when you are faced with a whole cauliflower the first time, it can be intimidating. Once you have it out of its plastic wrapping, peel back and snap off all the green leaves around the bottom. This will leave you with a thick stem. Use a very sharp paring knife and carefully slice through the floret stem, then gently release them from the head and set aside. Continue working your way around the head until all the florets have been cut off. Discard the stem and leaves. Depending on how you are preparing the cauliflower, you will most likely want to divide the large florets into bite-sized pieces. You can trim them and try to keep the smaller florets intact, or just simply halve or quarter the larger pieces. It is up to you. NOTE: If you are preparing a combination of cauliflower and broccoli, always cook the cauliflower in water first. Otherwise it can take on an unpleasant green tinge from the broccoli if that was cooked first! The flavors of Spain are highlighted in this delightful spin on a traditional Thanksgiving side dish. You can prepare and assemble this dish, refrigerate it, and finish baking the next day, easing the stress on the big day. Infuse the Cream and Make the Sauce: In a medium saucepan, heat the cream, almonds, garlic and rosemary over medium heat until steaming, and then pour into a blender or food processor and puree. Return to the saucepan and stir in the half-and-half and saffron. Heat until just below a boil. Remove from the heat. Add shredded cheeses and whisk until melted and smooth. Taste and adjust seasoning with salt and pepper. Keep warm over very low heat, stirring occasionally. Prepare the Cauliflower: Cook the bacon in a skillet over medium heat until crisp. Using a slotted spoon, transfer cooked bacon to paper towel-lined plate to drain. Discard all but 1 tbsp of the rendered fat. While the bacon is cooking, start the cauliflower. Add about 1 inch of water to a saucepan fitted with a vegetable steamer basket. Steam florets about 4 minutes, or until they start to soften but are still crunchy. Remove from the heat and set aside. Melt the butter in the skillet with the reserved bacon fat. Add the onion and cook over moderately high heat, stirring until golden, about 3 to 5 minutes. Add the tomatoes, peppers and prepared cauliflower and cook, stirring until cauliflower is lightly golden, about 2 minutes. Taste and adjust seasonings with salt and pepper. Assemble the Gratin: Transfer the cauliflower, tomatoes, peppers and onions to a 7 x 11-inch baking dish and pour the cheese sauce over the top. Sprinkle with the grated cheese and paprika. The gratin can be made to this point and refrigerated, covered, overnight. Return to room temperature before baking. Bake in the center of preheated 350°F oven for 20 to 30 minutes, or until bubbling and browned on top and the cauliflower is fork tender. Sprinkle the top with the crumbled bacon, minced fresh rosemary, and Marcona almonds. Let stand for 10 minutes before serving. Welcome to the rest of our virtual potluck! « Toasted Coconut Double Choco-Chunk Cookies for Chocolate Monday! Pushing chair from under me. Standing up. Hands clapping, clapping, clapping. I just finished preparing my Thanksgiving dinner and I am thrilled and jumping for joy to report that the cheesy cauliflower gratin dish I made using your wonderful recipe was successful. I just can’t believe that I did it. (Normally I never seem to get it right on the first try.) So thank you, thank you. It’s no doubt due to your terrific and easy-to-follow instructions. May your joys of today be surpassed by your joys of tomorrow. May the cards of life, hold no cards of sorrow. May you help spread the Thanksgiving spirit far and near. What time is dinner? Y’all are killing me with the gratins – one of my favorite dishes!!! Happy Thanksgiving. Oh my gosh, this looks heavenly!!! Jeanette, I would be honored to have you at my table anytime! But I would certainly ask if we could both cook together. I want to learn from you!! Make sure you check out these beautiful Creamy Baked Mushrooms too! Thanks for including this recipe in your Entertaining List Serena! !